We've had a great couple of weeks to round off the summer holidays - we finished finding all of the Shauns in Bristol and by the end, even Roo was pointing them out with delight. I can't help but remember my tiny baby when we started in London - she slept for most of the day then. She's gained three teeth in the last few weeks and is ever so close to her first birthday now. She's started in nursery and has found it a little tricky at the beginning and end of the day but is enjoying the middle. I have no doubt that she will grow to love it as much as D did. D is very ready to go back to school this week - he's had a fun packed week with his Granny and his Grandad while I've started back at work. It's been really good to be back at work - getting back into a classroom was a little weird after 13 months away but I do still enjoy it. Busy though! Weight wise, I continue to move towards the goal, albeit in fits and starts and not really through very religious tracking. I'm within a few lbs of my wedding weight and less than a stone from goal. I hope to get there around Christmas I think. I like to try and get different types of protein in front of Roo (and in fact D) and I've been a little reliant on cheese with her recently, so I thought a chickpea curry would be a good one. 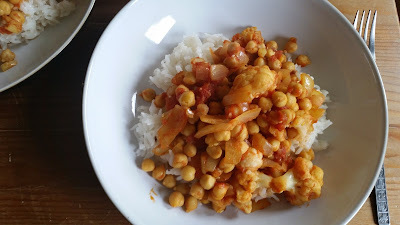 Traditionally, this curry comes with potato but for variety's sake and to lower the propoint count, I switched to cauliflower. This is great for baby led weaning as it is flavourful but not spicy. It also works well as a freezer staple for those times when I want to do something for us that isn't suitable for Roo. Stats: Works out at 5 propoints for a sixth. First melt your coconut oil in a wok over a medium heat. Add your onions, and garlic and sweat until the onion takes on a little colour. Add the mustard and cumin seeds and spices and combine well, allowing to release flavour over heat for another minute. 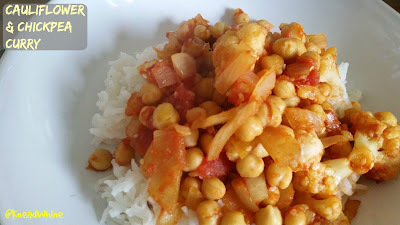 Add the cauliflower, chick peas and tomatoes. Bring to the boil and then simmer for fifteen minutes, until the cauliflower is cooked through. Add the sesame seeds and lemon juice, stir through and serve over rice.